Fishpond by the shore at Makaiwa Bay by the Mauna Lani Bay Hotel on Hawaii, the big island. Ancient Hawaiians were geniuses at making it easy to catch a fresh seafood dinner. They built fishponds along the shores and water inlets. The Hawaiians created rock walls that allowed sea water to ebb and flow into the ponds. They also included a gate into the wall that allowed small fish in and additional circulation of seawater. Once the small fish found their new home in the fishpond, they would eat and grow to the point that they became too large to swim back through the wall. See this satellite view of Molii Fishpond on Oahu to get a better idea of how the ponds were shaped and constructed. You can distinctly see the wall between the sea and the ocean. Fishponds were a sign of wealth in Hawaiian culture. The fish from the ponds was primarily reserved for the ali’i, who were the chiefs. If commoners were caught stealing fish from the fishpond, he or she was sentenced to death. – Molii Fishpond – This pond (photo on left) is on Kualoa Ranch’s private property, but you can take a guided tour to see it. A tour fee applies. The Koieie Fishpond near Kïhei is being restored. You can learn about the restoration efforts and how you can participate here. 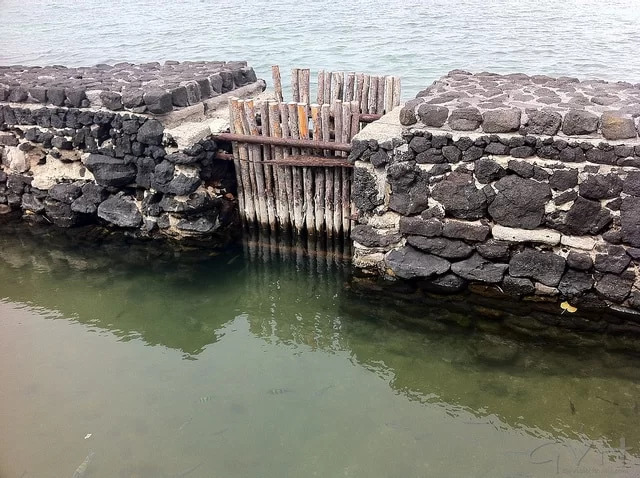 – There are seven fishponds at the Mauna Lani Resort. – Near the grounds of the Marriott at Waikoloa Beach Resort, you’ll find several great examples of fishponds. Molokai probably has more fishponds than any of the other islands. According to this site, Molokai has as many as 60 historic fishponds along the southern coast. You can see these fishponds from Highway 450. – Loko Lopa Fishpond is at Lopa Beach and is accessible by four-wheel drive. ancient hawaiian fishponds don’t get the tourist attention they deserve. Aloha Pua – I have been fortunate enough to stay at the Mauna Lani Resort. The history and well preserved grounds around the resort are really second to none. So, of course as I wrote this post about fishponds, there was no way I’d forget to mention those lovely series of ponds. I have walked upon the wall at Heeia Fishpond several times with my husband who was interested in aquaculture at the time, early 1990’s. The fishpond walls were in bad shape due to the proliferation of mangrove trees growing on and through the wall, breaking up the stones. No one was really caring for the pond then. Happily, today, it is stocked with Moi (a Hawaiian delicacy fish), and being taken care of by the community. Read the article below for more info. 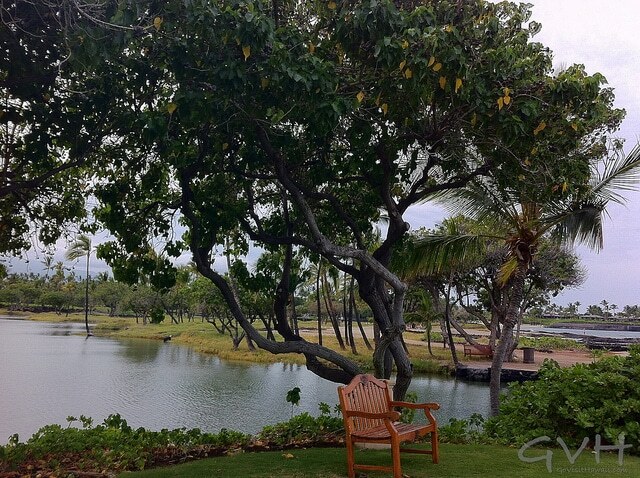 HawaiiVacationGifts – That’s great to see that the ponds are being restored. Thank you for adding that article. Was Moi once a fish reserved only for royalty? It seem like we were told that once at restaurant in Hawaii. why would you want to show off things about hawaii. as a hawaiian i don’t want tourist to go and mess up something that is meant for the kanaka. because of that reason so much of the secrets of the kanaka are no longer secrets. i agree with kila…. hi im keaokea (: i am a haumana from Ke Kula Kaiapuni ‘o ‘Anuenue and WE DONT want tourist to go and MESS up something that is meant for the hawaiianz/kanakas. these fishponds are ANCIENT and KAPU, these were made for us hawaiians not these tourist. like what kila said, whyy would you want to SHOW OFF things about hawai’i? because of that reason so much of the secrets of the kanaka are no longer secrets! There are no secrets given away here…and no suggestion to do anything other than simply admire these ingenious inventions. As a longtime visitor I agree that non-kanaka should leave a very small footprint. But I admire greatly the ancient fishponds near Hamoa at Hana (Maui). I have been to the Loko Lopa Fishpond pond on Lanai. It is beautiful, but looks as though it also needs some restoration.